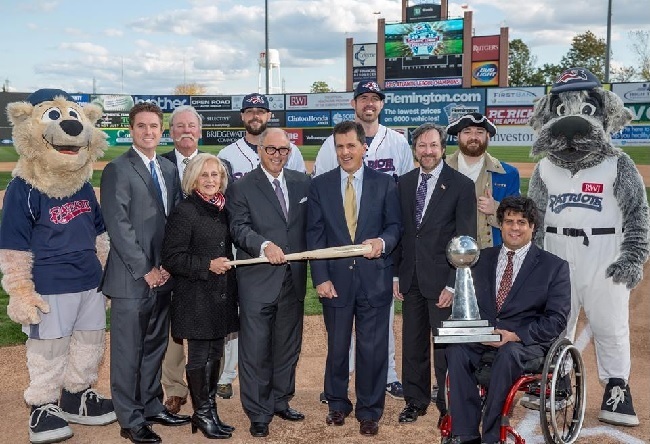 Somerset County Freeholder Director Mark Caliguire, Freeholder Deputy Director Patricia Walsh, Freeholder Patrick Scaglione and Freeholder Brian Levine were on hand to congratulate the Somerset Patriots on their sixth Atlantic League Championship win during the 2015 baseball season. The Freeholders, joined by Somerset County Park Commission Vice President Bill Crosby and Parks Director Raymond Brown, presented an engraved commemorative bat to Patriots owner Steve Kalafer and Somerset Patriots Baseball Club President and General Manager Patrick McVerry at the ballpark last week. “TD Bank Ballpark is known as ‘the jewel of the Atlantic League,’” said Freeholder Caliguire. “It’s also one of the jewels of the Somerset County economy. "The Patriots have become an integral part of our community and they are run by owners who commit to excellence in the experience they provide to Somerset County baseball fans,” he continued. “The partnership between the Kalafer family and the county Freeholder Board has been a great example of a successful public-private partnership,” he said. “They win championships and have brought 6 million fans to the stadium since their inception because they provide a first-class baseball experience." TD Bank Ballpark officially opened its gates in June 1999 and has been the premier family and community destination in Central New Jersey since that time. The 6,100-seat ballpark is owned by Somerset County and managed by the Somerset Patriots, who have averaged over 5,200 fans per game and 370,000 fans per season since 1999. “In addition to providing affordable family entertainment, the ballpark contributes to the overall success of Somerset County’s tourism efforts,” Freeholder Caliguire said, citing a recent report that county tourism expenditures topped $1.1 billion in 2014, a new high for the county and a trend that is outpacing both state and national industry averages. The tourism industry in Somerset County provides nearly 20,000 jobs for county residents. “The ballpark also is one of the great brownfields-reclamation success stories in our county and in New Jersey,” Freeholder Scaglione noted. The ballpark was built on the former American Cyanamid parking lots just north of the NJ Transit Raritan Valley Line, after that portion of the site was deemed clean by the U.S. Environmental Protection Agency. Accolades and milestones for the ballpark continue to roll in. The Atlantic League of Professional Baseball has named it the 2015 Ballpark of the Year. This season, the Patriots reached the 6-millionth-fan mark in August. Earlier this year, TD Bank Ballpark was named Ballpark Digest’s “Best Independent Minor League Ballpark” in the country. It is the second time that the ballpark has been named Ballpark of the Year by the Atlantic League, last receiving the honor in 2007.